BBC NEWS | UK | Magazine | Were they one of Nelson's men? There's a running joke in family history circles, says Bruno Pappalardo, naval expert at the National Archives. "If every man said to have served in the Battle of Trafalgar actually did," he says, "the ships would have sunk." Pappalardo is the man who is opening up the records for genealogy fans to check just that. The Battle of Trafalgar, in 1805, was the most famous naval battle in history, involving 18,000 men - and, the records now show, one woman. One of the Royal Navy's most important victories, it was the final act of naval hero Horatio Nelson. From June 28, national celebrations will mark 200 years since he defeated Napoleon's French and Spanish forces. But there is also a more personal approach - the Trafalgar Ancestors database shows whose forbears were the "hands on deck" [see internet links on right]. One in six of the 110,000 men in the Navy served in the battle. The 1811 census recorded 6.3m men in the UK and the Royal Navy was one of the biggest employers. "It was a very cosmopolitan navy", says Pappalardo. "Many men came from different nationalities - Turkish, Chinese, French, Italian, Irish, American and African. The navy recruited near and far." 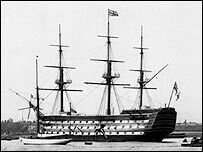 On board Nelson's 828-crew HMS Victory, they came from the UK, West Indies, America, Holland, Italy, France, Malta and Ireland. Of the 18,000 at Trafalgar, 4,000 - almost a quarter - were Irish. The information has been gathered from ships' muster books and paylists, certificates of Navy service and hospital applications made by men who later applied to become in-pensioners at Greenwich Hospital. Records show the youngest recruit as "third class boy" Thomas Wilcott, eight, on the HMS Neptune. The eldest, 68-year-old John Adams, was onboard the Royal Sovereign. Sir John Franklin, later the arctic explorer, also served. The archive has just one woman of the fleet, a Jane Townshend, carrying out "useful services" onboard The Defiance. "She may have been tending the wounded, cooking, washing clothes," says Pappalardo. "The muster books recorded no women, because officially they weren't supposed to be on board. But some masqueraded as men to go to sea with their husbands, boyfriends, lovers, or to escape mundane life. "There were boys and men who gave their birth place as 'at sea', so women must have been there. Users can search, for free, by name, birth place, age, ship name, rank or rating - the "ordinary seaman" and "able seaman" terms that endure to today. Military service and ship records, and details of the men's families, will go online as the project develops. But the archive, and accompanying exhibition, already reveals much about life amid the "crack force" fleet. "We've found there were 4,000 landsmen, very inexperienced men," says Pappalardo. "The ships were the sophisticated weapons of mass destruction of the time. Sailing a ship in weather conditions, knowing currents, when to strike. Any false move could've been fatal. "But they'd trained them up to be that crack force - that's where victory comes from at Trafalgar."